No trip to the Keys would be complete for Leon and me without a visit to the pine rockland ecosystem of Big Pine and No Name Keys. The ecosystem sits on a thin layer of soil over a fossilized coral reef (known as Miami oolith) and lenses of fresh water near the surface. 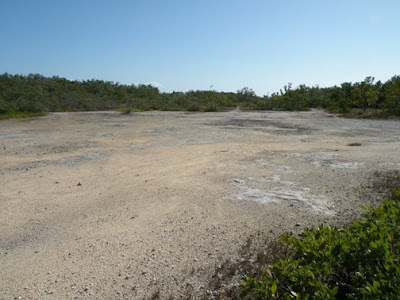 We observed a very similar ecosystem several days earlier at Long Pine Key in the Everglades. 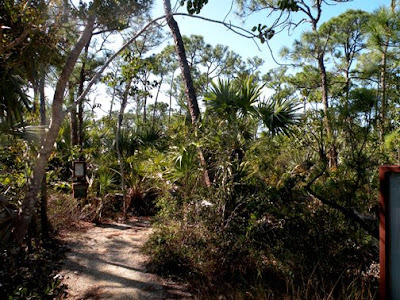 A series of nature trails crisscrosses the island. I've always been impressed with the interpretation along the trails. 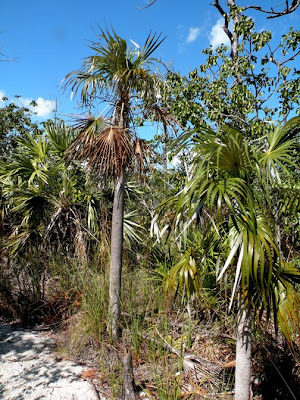 One sign explains how to distinguish the three species of palm that grow in the park, and we spend much of the walk identifying palm trees. 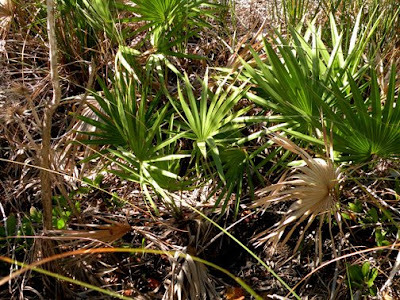 Palmettos have a recumbent growth habit. The remaining two species grow upright. 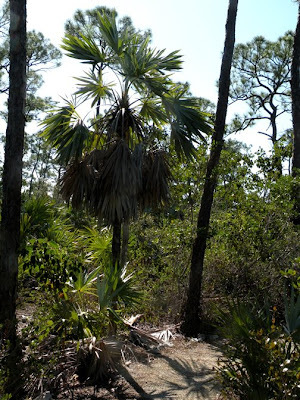 The fronds of silver palms terminate in very thin "fingers." Thatch palms have less divided fronds. 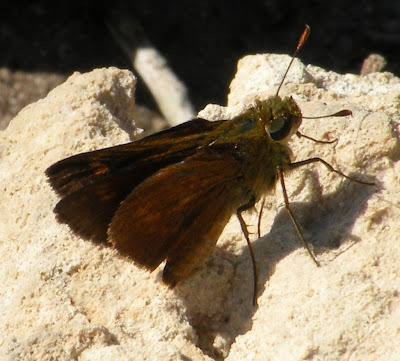 There are few insects here, though I see a couple of skippers and a few dragonflies. 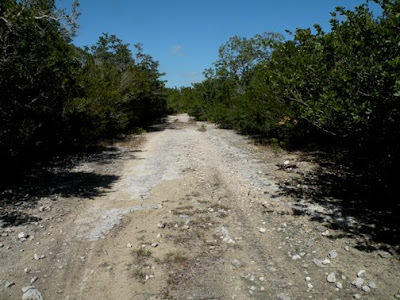 After a bit of a wander, we make our way over to No Name Key for a hike on a fire road through the National Key Deer Refuge. 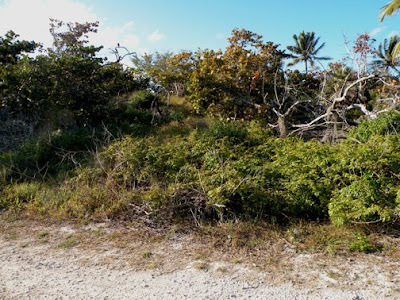 The vegetation is a fairly scrubby hardwood hammock, grading down to buttonwood and mangrove growing in mud flats at the end of the trail. The mud flats at the end of the trail look like great tiger beetle habitat. Indeed, I encountered S-banded Tiger Beetles (Cicindela trifasciata) in the mud. No collecting- this is a National Wildlife Refuge, after all. Unfortunately this species is very wary, so all of my photos are just blurs. We did photograph some other insects. Unidentified Skippper. Aak, I don't have a guide with me. ID Later. Check out the blue antennae. We did get to see two of the endangered Key Deer while leaving. We did not get good shots of the one on the trail, but Leon got a nice photo of a buck on the road out of town. They are about the size of a German shepherd, but with much longer legs. 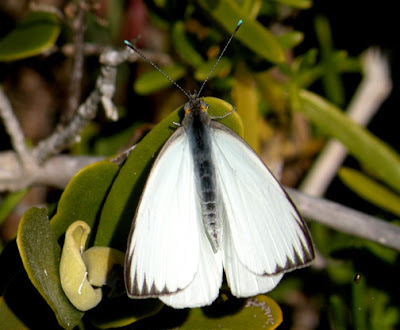 Speaking of endangered species, after our hikes on Big Pine Key, we headed north to Bahia Honda Key to see if we could get a look at the endangered Miami Blue butterfly. We saw lots of the host plant (Nickerbean), but looked a long time without seeing blue butterflies. Finally, we saw a single blue butterfly. It never landed close to the trail. I took a distant photo. Through the magic of zoom lens combined with enlargement and cropping in photoshop, I got a good enough picture to identify it at the Miami Blue. It was a fine day in the Keys! I love the photos & your description, esp bec it is so damn cold here! I was in Bahia Honda a couple years ago - wasn't aware of the endangered butterfly, but I did collect a dead branch of Coccoloba uvifera (w/ permit) from which emerged two very nice buprestids (Polycesta angulosa. I haven't been to Long Pine Key in 20+ years, but your photos bring back memories. Great post Doug. Sometimes we have to take what we can get in photographing butterdiles. SOme of them are so small too that even with a zoom lens we have to do a lot of cropping. You went on vacation without your field guides?????????? Doug! What happened? Fabulous. I almost felt like I was there. I would have truly been intrigued by the tiny deer...I always thought our NW deer are small...that one is new to me. So when are you going to write about the Butterfly pupa being raised by ants? Looks like it was a cool hike. Miss the snow do you?? Great post. Thanks for sharing your hike. I've always wanted to see mangrove habitat. From what I've heard about it from television there is a lot going on in there. Neat looking deer. looks like a wonderful vacation- LUV the Key deer! Next time - can I come? lilliannattel- Thanks and welcome to the Tapestry. Ted- When you come to town next month, I'd like to find our moer about getting buprestids and cerambycids out of dead wood. Joan- The frustrating part here is that I'm pretty sure I could have gotten a much better picture if I could have walked up closer to the butterfly- ut it was in a Keep Out zone. celeste- I now have ttoo many guides tthat would need to come with me. I should probably keep bringing the butterfly guide no matter what. Mark- You are right, I'm way overdue for a post on myrmecophyly. Dave- Yeah, I spent the entire vacation pining for winter. cedrorum- mangrove is an exceedingly difficult habitat to visit. Think cypress knees, but at a much greater density. CG- It posed very well for Leon. I was driving and couldn't get to my camera. TR_ You should come down for this tip next time. We all visit Key West every year.